The LP02, manufactured by Hukseflux, is an ISO-second-class pyranometer that monitors solar radiation for the full solar spectrum range. It connects directly to a Campbell Scientific datalogger and is used for many meteorological applications. The LP02 measures solar radiation with a high-quality blackened thermopile protected by a dome. The blackened thermopile provides a flat spectral response for the full solar spectrum range, which enables the LP02 to be used under plant canopies or lamps, when the sky is cloudy, and for reflected radiation measurements. The LP02 includes a bubble level, three adjusting screws, and a cable gland. The bubble level and adjusting screws allow the sensor to be levelled without using a levelling base. The gland facilitates cable replacement. The LP02 produces a millivolt signal that is measured directly by a Campbell Scientific datalogger. 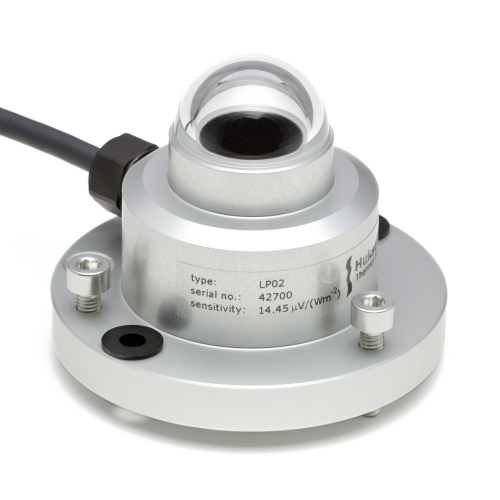 Two LP02 pyranometers can be mounted back-to-back to make a low-cost albedometer; contact Campbell Scientific for more information. The LP02 includes a bubble level and three adjusting leveling screws, which allow the sensor to be leveled without using a leveling base. The CM225 Solar Sensor Mounting Stand is used to attach the sensor to a crossarm. The CM225 consists of a rectangular plate, mounting bracket, U-bolts, washers, lock washers, and nuts. The LP02 should be mounted away from all obstructions and reflective surfaces that might adversely affect the measurement. If the sensor needs to be mounted at an angle, a CM255 or CM255LS adjustable-angle mount can be used instead. Should the dome of the LP02-L be cleaned regularly? Yes. It is recommended to clean the dome weekly. However, depending on the environment the pyranometer is deployed in, it may need to be cleaned more frequently—perhaps daily. The frequency of the cleaning schedule varies based on the amount of buildup on the dome caused by precipitation, dust, and biological films. If a LP02-L is reporting 0 W/m2, NANs, or unrealistic values, should it be recalibrated? Perhaps, but it is more likely that there is a wiring or programming issue. If the pyranometer is reading 0 W/m2, separate it from the data logger and measure the resistance across the sensor leads. If the reading is approximately 0 ohms, the sensor has likely been damaged and will need to be repaired or replaced. For information about the process of returning equipment to Campbell Scientific, refer to the Repair and Calibration page. Does the LP02-L need to be calibrated? Yes. Depending on the application, it is recommended to have the sensor calibrated every one to two years. What type of signal does the LP02-L produce? The LP02-L produces an analog millivolt signal that is linearly related to the amount of solar radiation incident on the device. This relationship is based on a calibration coefficient that is entered in the data logger program. What instruction should be used in CRBasic for the LP02-L? For best results, use a differential voltage instruction, such as VoltDiff(). A single-ended voltage instruction, VoltSe(), could be used; however, this would not take full advantage of input reversal, which allows for the subtraction in common-mode gain errors. For more information, see the “The Benefits of Input Reversal and Excitation Reversal for Voltage Measurements” white paper. What does the LP02-L measure and in what quantities? The LP02-L measures solar irradiance with primary units of W/m2 and over a range of 0 to ≈1000 W/m2 for terrestrial radiation. Other units can be measured with modifications to the measurement instruction in the data logger’s program.